MIDDLETON, Wis., and NEW YORK — Consumer products giant Spectrum Brands Holdings Inc. plans to combine with its largest shareholder, public holding company HRG Group Inc., in a transaction valued at $10 billion. The companies said Monday that, under the agreement, HRG will effect a reverse stock split in which HRG shareholders will receive in the aggregate a number of shares of the combined company equal to the number of shares of Spectrum Brands currently held by HRG, subject to certain adjustments. 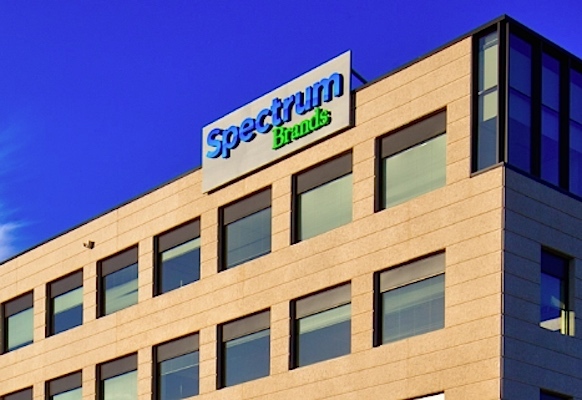 Upon closing of the transaction, Spectrum Brands shareholders will get one newly issued share of the merged company for each share of Spectrum Brands that they owned before the combination. Plans call for the combined company to be named Spectrum Brands Holdings Inc. and trade under the ticker symbol SPB. The company will be based in Middleton, Wis., where Spectrum Brands now has its headquarters. The current Spectrum Brands executive team, led by chief executive officer Andreas Rouvé, is slated to lead the combined company. will be the base for the merged company. With consumer products sold in about 160 countries, Spectrum Brands is a leading supplier of consumer batteries, residential locksets, residential builders’ hardware, plumbing, shaving and grooming products, personal care products, small household appliances, specialty pet supplies, lawn and garden products, home pest control products, personal insect repellents and auto care products. Its roster of brands includes Rayovac, VARTA, Kwikset, Weiser, Baldwin, National Hardware, Pfister, Remington, George Foreman, Black + Decker, Tetra, Marineland, Nature’s Miracle, Dingo, 8-in-1, FURminator, Iams and Eukanuba (Europe), Healthy-Hide, Digest-eeze, Littermaid, Spectracide, Cutter, Repel, Hot Shot, Black Flag, Liquid Fence, Armor All, STP and A/C Pro. Spectrum Brands noted that its merger with HRG won’t impact its $2 billion deal to sell its global battery and portable lighting business — which includes the Rayovac and Varta brands — to Energizer Holdings Inc. The transaction also won’t affect Spectrum Brands’ plan to explore strategic options for its appliances business, which the company said has drawn strong interest from potential buyers, with an expected agreement and closing by the end of fiscal 2018. Spectrum Brands added that, overall, it expects gross proceeds to $3.6 billion to $3.7 billion from the sale of the two businesses. HRG’s board is slated to be replaced by the Spectrum Brands board. Ehsan Zargar will resign from the Spectrum Brands board and will be replaced by an independent director to be selected by Leucadia National Corp., HRG’s biggest shareholder. Leucadia also has a right to designate one director, as long as it owns at least 10% of the combined company’s shares as of the closing. That director is initially expected to be HRG chairman and CEO Joseph Steinberg, the current Spectrum Brands director and Leucadia chairman. Following the completion of the merger, 45% of the company is expected to be widely held by HRG’s legacy stockholders, and Leucadia is expected to hold about 13%. The transaction is expected to close by the end of the second calendar quarter of 2018, pending shareholder approvals and other customary closing conditions. The companies said they don’t expect to need any regulatory approvals for the transaction.